As you arrive in across the clear blue water covered coral reefs, golden sands meet green sweeping fields leading up into the dense tree filled mountains which surround Montego Bay. At this point you are reminded that you have reached the Caribbean, yet confused as to which island you may be on. Jamaica seems to have it all. As Columbus once described it – ‘the fairest isle that eyes have beheld’. Welcome to Jamaica! Where the phrase ‘ya man’ can be substituted for words meaning ‘yes’, ‘of course’, or any term expressing a positive response. The smile seems to be a permanent fixture on the face of Jamaican people whom have a sense of humour to match. Opinionated, confident, relaxed and very easy to get along with, the Jamaicans will ensure your stay is as pleasant as it is luxurious. For the family there are endless amounts of activities suitable for all ages. Water sports, all terrain exploring by vehicle or horseback, canopy adventures through the mountains or the simple enjoyment of a beachside game of football, cricket, or much needed horizontal time for the parents lapping up the sun and forgetting the dilemmas of the 9-5 world which will now seem so distant. Couples can romance in the moonlit, star studded clear skies on a warm night. Watch the sunset cast an orange painting across the horizon while sitting to a candlelit dinner. Or just enjoy the privacy of the many luxurious hotels this island has to offer. Travelling singles looking for a party, the well known ‘hip strip’ will provide reggae, hip-hop and jazz with a perfect mix of locals and visitors in its many bars and waterfront clubs. Open till the very late hours of the early morning. A stroll to jump into the warm Caribbean waters is the perfect hangover cure the following day. Golfers, or anyone of interest in the game will have a challenging decision selecting from the many prestige signature golf courses surrounding Montego Bay. The close proximity of Montego Bay holds many interesting historic sites, adventurous activities, spectacular views and secluded beaches. Jump into one of the regular collective mini-buses from your hotel and head to the nearby Rose Hall Plantation property. Once a 6000 acre sugar plantation, it’s the site of the Rose Hall House – a stone based Georgian mansion from the late 1700s where Annie Palmer (‘the white witch of Rose Hall’) lived and earned the nickname by seducing slaves working on the plantation, make them her lovers, before murdering them upon becoming bored of their company. Jamaican folklore says this happened on three occasions before the fourth slave turned on Annie and killed her. Guides on the property will give an interesting history by her grave of the house and property before ending with a beautiful recital of a Johnny Cash song about the house ‘Ballad of Annie Rose’. A stone throw away, on the same property, secluded amongst the trees at Cinnamon Hill is the Jamaican holiday home of the late artist and his family. The Cashs spent many a holiday in the house in the later part of the couple’s lives. All of the house and contents have been maintained as they were since Cash’s death, at the request of his family. The outside entertainment area overlooking the shores of Montego Bay from the mountains is available for functions, weddings, groups or families. Although seemingly tranquil from a distance, the surrounding hills boast some of the most adrenalin filled activities in the area. 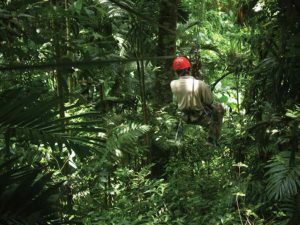 Chukka tours offer the likes of horseback riding, all terrain quad and buggy tours through the forest, or for a different view altogether you can take the adventurous tree canopy zip-line tour. Harnessed into cables up to 200ft above the ground, you will fly in and out of the treetops caching glimpses of the wonderful surrounding scenery of beaches and mountains. Located on the furthest NW point of the island, 80km from Montego Bay is the famous beach resort town of Negril. Since road improvements in the 70s Negril is an easily accessible destination boasting the same diversity of sites and activities as Montego Bay with a different twist. Midway along the road, the historical own of Lucea highlights the journey. Home to Fort Charlotte and the army barracks (one of the largest on the island), and a setting destination for the famous Jamaican movie Cool Runnings. A coffee stop and short stroll makes for an interesting, informative few hours. On then to Negril you need not read the signs to realise you have reached your destination. A stroll along ‘seven mile beach’ (longest on the island), occasionally stopping for a cooling dip, jump into a catamaran for a tour of the coastline before reaching world famous award winning ‘Ricks Cafe’. The crowd stands, beer or cocktail in hand, watching cliff jumpers take one of the 10-20m plunges into the sea, either enjoying the entertainment or building the courage to take the leap themselves. With live reggae music on stage in the background, a party vibe at the bar, and entertainment at the cliffs there is no wonder it was voted one of the top 10 bars in the world! Away to the ‘Rockhouse Hotel/Restaurant’ in the evening and the unobstructed sunset will blow your mind and cast it back to the event filled yet relaxing day just passed. Traditional plate of ‘jerked’ chicken, pork and/or beef which adds a slightly spicy flavour, and another beverage you will be content to retire the day in total satisfaction.